Brass eyelets to fit our closers / pliers. Bags of 20 with backing rings. XSmall - 4mm, Small - 6mm, Medium - 8mm, Large - 10mm and X/Large - 12mm are available. Enlarge Photograph Machined in steel and of solid construction. When any size is showing out of stock, take a look at the eyelet pliers, they're brilliant and they also give you a range of 4 interchangeable jaws all in one tool. 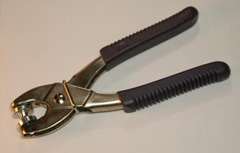 Eyelet pliers for 6mm, 8mm and 10mm eyelets (includes 1 set of jaws). There is no 12mm jaw available as you would need arms like 'The Hulk' to close them! Additional jaw sizes are available below. Additional jaw sets for the above pliers in 6mm, 8mm and 10mm. All jaws are now turned from stainless steel. Enlarge Photograph Small (6mm) eyelet pliers plus 100 brass plated eyelets. Enlarge Photograph Standard multi-size, steel revolving hole punch pliers with size hole sizes - 2mm, 2.5mm 3mm, 3.5mm, 4mm and 4.5mm. Sometimes silver sometimes black ! Wad punch set. Drop forged, heat treated steel. 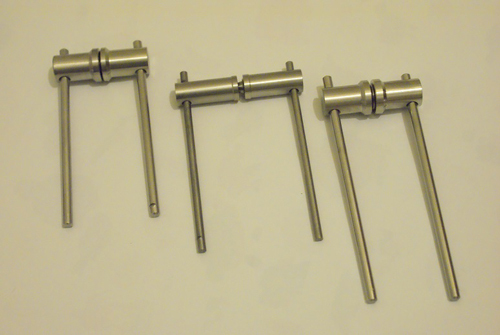 9 punches ranging in size from 2.5mm, 3mm, 4mm, 5mm, 6mm, 7mm, 8mm, 9mm & 10mm. This set is great value for money and can be used to punch leather, card, canvas etc. Wad Punches for punching larger single holes. No more mucking about cutting a circle of small holes with your revolving punch pliers. You thought I didn't know that you do that didn't you? Enlarge Photograph No more mashed fingers! Enlarge Photograph A good, tough waxed thread for all purposes. Available in white, white or ......... you've got the idea.....white! 6 x size 1 needles or can mix sizes if required. Yeah, don't you just know some smart arse is going to tell me there's only four in the picture! Can also be used to sew up the damage that you inflicted with the scalpel..........see Nickel Steel scalpel handle below. Small 1oz. block or disc for use on sewing thread, hood braces etc. Enlarge Photograph For safe cutting of leather/fabrics. 1' long or 30cm for the converted. Great for leatherworking, performing DIY surgery on your boils and many other uses. NOTE: If you intend to use this item for DIY surgery you may find blades useful.......see below. Enlarge Photograph Professional, chunky acrylic handle for those of us (like me) with bunches of bananas for hands! This is the product that makes leatherworking simple. Punch a hole, whack in the rivet and smack it with a hammer.......bingo, a secure fixing in seconds. Price is per dozen. Enlarge Photograph Solid brass rings. There's nowt else to say! Enlarge Photograph What can you say about a stainless steel tethering ring? It's round, it's made of stainless and it's a ring! Enlarge Photograph Nickel plated with overlapping, sprung pincer jaws. Over all length 60mm and internal measurement of the D is 15mm (1/2inch). Enlarge Photograph Many uses..........you choose! 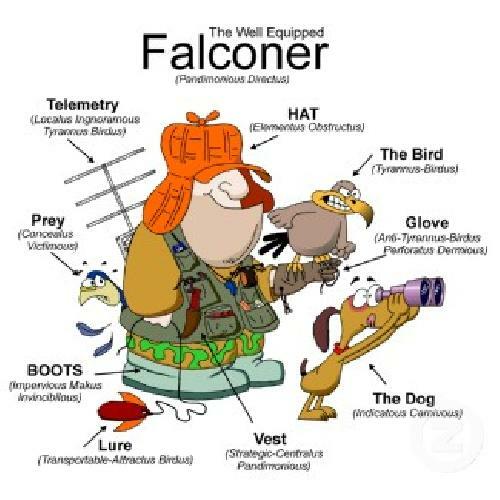 As probably fitted to the top of your falconry bag. 'D' shackles are galvanised steel. Enlarge Photograph What? you say. Think of a chain link that you can unscrew to open and then screw back together again. Yup! that's a quick link. Enlarge Photograph 4 piece press studs. Black finish (5/8"). Can be closed with the press stud closer shown below. Priced per dozen. Enlarge Photograph Press stud closers (for 5/8inch studs). No more mashed press studs....or fingers! Enlarge Photograph 4 inch cable ties. Hundreds of uses! Enlarge Photograph Looks a bit like clear plastic tube. Strange that, because that's exactly what it is. Can also be used on syringes for crop tubing. 50p per foot. Enlarge Photograph Sculptured, silver and gold colour hood beads for the DIY hood maker. 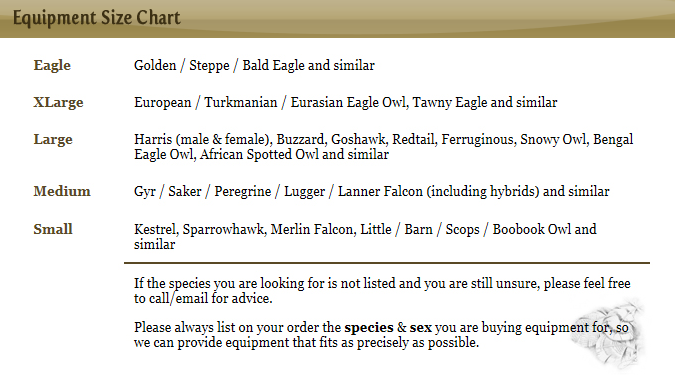 Smaller size for all normal size hoods and larger for Eagle sized hoods. Clever huh? Enlarge Photograph Set of 5 diamond coated files for use with the larger hawks and falcons. These come in a rigid plastic case - not as currently shown in photo, but almost identical. New photo when I get around to it! A graduated pinpoint awl that will punch holes from 1mm to 9mm with the tapered steel blade. Invaluable in leather working. A good quality tool that will mark stitch spacing at 4mm intervals. (7 points to the inch) Can also be used to create the appearance of a line of stitching as a decoration. Used with care it can also duplicate the puncture wounds of a bird of prey and make you look well 'ard!! Enlarge Photograph Available in two sizes! These perch rubbers are designed to be used by anybody wishing to make their own bow perches or beating a burglar about the head with intent! The medium size is 1.5" x 16" long, the large is 2" x 17" long. Both are bored to accept 12mm bar but can be bored further to accomodate a larger bar size if you have the tools to do it. Each rubber has a fine ribbing (starting to sound at all familiar lads!?) that gives great grip but is still very easy to keep clean. Enlarge Photograph Gift Vouchers from £5.00 up to.............you name it! Enlarge Photograph I admit that I would love to relieve you of �30.00, �40.00 or even considerably more for a bird bath, but why would you pay that for a flimsy fibreglass bowl when you can visit any garden centre and pick up a planter tray for �6.99 ? Despite the snidey remarks aimed at me by another supplier who doesn't want you to know about these, I have often seen them, they are black or green, large and sometimes rectangular in shape, which matters not a bit, up to 4" deep which is more than enough and have a nice big rolled edge so it's safe and comfortable for your bird to perch on. They hold water perfectly............what else do you want them to do? On the basis of that, I have yet to figure out why you might pay �30 and more. So I don't stock baths any more!